NEW ! SUPER STUDY BOAT PLANS ... Delivered by DOWNLOAD to your computer on a USB stick by AIRMAIL The study plans have lists of materials & equipment etc & these will be useful in costing out the complete boat. Each STUDY PLAN contains ALL the construction drawings for each material - STEEL & ALUMINUM - with up to 25 sheets per plan! Voyager 450 Kit or Cutting files & boat plans. The Radius Chine Voyager 450 is based on our highly successful Voyager 495 design and incorporates several features from the R432 and R434 sailboats. The Voyager 450 has full standing headroom throughout. Kit or Cutting files & boat plans. 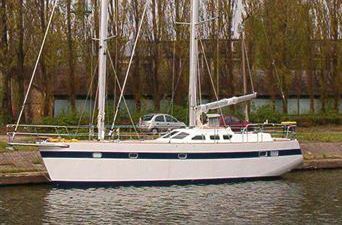 Voyager 450 - Cutter rig version shown here. 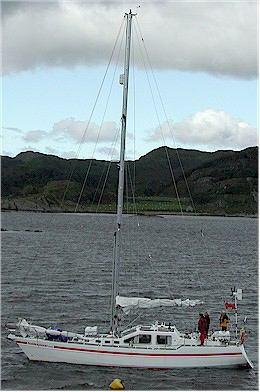 Voyager 450 - Staysail schooner rig version shown. Accommodation plan can be varied to suit individual requirements. First side plates in place - From this to see below ! 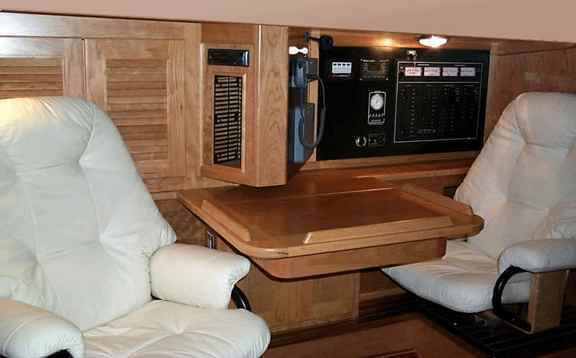 Boarding is easy from your dinghy when you have this type of transom. This arrangement can be used in several of our sailboat designs. 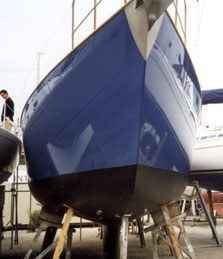 Note the beautiful finish on the radius chine hull. Hello Bruce Just thought you might be interested to know we were paying customers on a 44' Bruce Roberts design boat in Iceland this year. 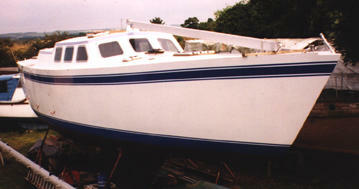 Our skipper Ashley Woods had built the boat, 'Bold Explorer' himself. Bold Explorer felt extremely seakindly and safe, and was simple but fun to sail. 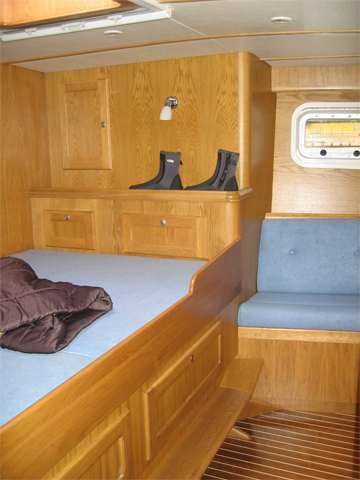 She has a large deck saloon which allows you to see the horizon from inside the boat, a great boon on the colder days. The requirement of the British Department of Transport, governing Commercial Vessels, covers stability, construction, machinery, operation and manning; and it's suitability for World Wide operation. 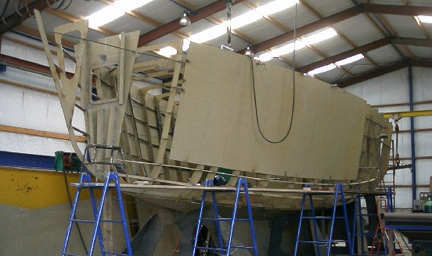 The vessel has been constructed under the careful scrutiny of YBDSA surveyors to ensure its proper construction and compliance with category "O", as a Sail Training Vessel. I really should have dropped you a line years ago about this but, I am sorry, I just didn't think of it until now. 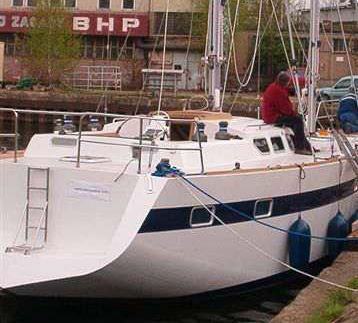 Some years ago I met you at a boatshow in Houston, Texas where I purchased a set of boat plans for your Offshore 44 design. In 1983, after years of hard work and saving every penny, I launched the boat. In March of 1986, having outfitted the boat and sailed around in Galveston Bay for a few years, I left to go cruising. During the next almost 5 years I sailed to central America, across the Pacific, along Southeast Asia, up the Red Sea and through the Suez Canal, through the Mediteranean Sea and across the Atlantic back to the USA. The circumnavigation was done mostly as a singlehander except for my dachsund, Hilda. The boat performed splendidly; very forgiving to someone who, until I left Galveston, had never sailed on the ocean. I rigged it as a cutter which tracked well and which I could balance under all but the worst conditions. I rarely had to steer, relying on a Monitor wind vane rig for this. I rarely saw another boat I envied over the one I had. The only thing I would have changed was to have a slightly taller rig. That trip was and remains the greatest adventure of my life. I am back to the regular life of a 9-5 job living in Atlanta, Georgia. USA. I have written part of a book from my experiences which I should finish someday but even if I don't I have a rich set of memories. Like, I think, most people, if you ask me what I was doing this time 2 years ago I might be hard pressed to tell you. Conversely, I can recall any part of my yacht journey to the month or week. I am gratefull that I had the luck to pull it off and see the world and meet its people as a traveller rather than as a tourist. Thanks for designing a fine boat.